This issue's cover illustration is from Martin Jenkins' retelling of Jonathan Swift's Gulliver, illustrated by Chris Riddell. Chris Riddell is interviewed by Joanna Carey. Thanks to Walker Books for their help with this September cover. 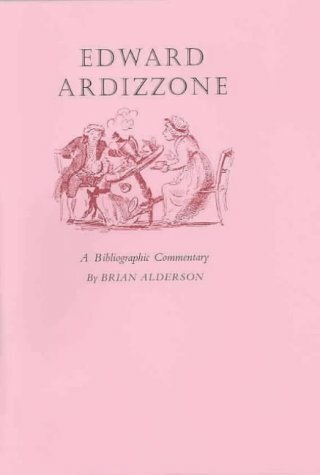 Gabriel White, in his study of Ardizzone published in 1979, the year of the artist's death, acknowledges his debt to Brian Alderson's Edward Ardizzone: a preliminary handlist of his illustrated books 1929-1970 (1972). Now, over thirty years later, we have the final work. It lists every book illustrated by Ardizzone in dense staccato detail: publisher, number of pages, nature and quality of paper, number of illustrations and their technique, sequence of editions and translations, and so on. It also surveys Ardizzone's work for independent book jackets and magazines and other one-off tasks. It will clearly be of permanent use to scholars and researchers. However, will it also be of interest to the readers of Books for Keeps? The answer to that question is an unequivocal yes, in large type and ringing tones; because this is not simply a bibliography but a bibliographic commentary. Alderson is a knowledgeable, discriminating, just occasionally acerbic, guide through the gamut of 180 books, explaining on the way, the nature, the history and development of each. For anyone at all interested in Ardizzone there is fascination just in looking at the sequence of productions. First of all In a Glass Darkly where the artist, already in his late twenties, shows with the characteristics of his style already well developed, with all the drama of cast shadow; and then, only a year later, Little Tim makes his first appearance, and, in 1939, we have the first happy encounter with Dickens in Great Expectations as well as Maurice Gorham's The Local. In this last Ardizzone begins to explore that rich vein of appreciation and observation of London life, spreading out through pubs and bookshops and side streets from the drawing desk in Elgin Avenue where the artist sits, slightly raised to avoid the draught, diligently pursuing the way of his imagination. And we actually see him there, enthroned without pretentiousness, because this bibliographical commentary, as well as being handsomely produced, is well illustrated. There are nearly eighty pictures, some of them in colour, and many chosen with a particular purpose of demonstration. We see, for instance, three parallel depictions of Tim at different stages of his (and Ardizzone's) development, as well as other roughs and finished drawings from the Little Tim books. We see too, in a sequence of three drawings, the way that Ardizzone worked up a drawing to its final state. Two notes from the artist explain how it is done. What they don't quite explain, of course, is how at the same time there come those feelings of dusk, of nostalgia, expectation and the importance of the moment. Oliver Simon records how hard Ardizzone found the struggle for recognition in the pre-war years; fortunately his reputation was well enough established to allow him to be chosen as an official War Artist; service which resulted in the many drawings for Ardizzone's own Baggage to the Enemy of 1941 - as well as many works, now in the Imperial War Museum, not produced specifically as book illustrations. The artist's next significant publication was Peacock Pie and, looking back to 1946, it might be possible to think of it as some kind of postwar celebration. The facts of its genesis were not quite so simple. As Alderson explains, Ardizzone began work on the book while still covering the Italian campaign. On November 5th 1944 he records: 'Just completed a tremendous month's work here, twenty-two paintings, of which I am destroying five as not up to standard, three Christmas cards and sixteen drawings for Peacock Pie done in my spare time after dark.' There may be several morals to be drawn from that note; certainly it brings home to one, as so often in turning the pages of this book, that the immense professionalism worked in favour of, and not against, the intimacy of the vision. There are more insights into Ardizzone's approach in an essay he wrote in 1957 and reproduced here as 'On the Illustrating of Books'. The artist is illuminating on what he takes to be the distinctive character of the 'born illustrator'; and, though he disclaims any erudition, he has useful things to say about Cruikshank, Daumier, Dore and (in particular) Charles Keene. These words from the artist himself are only one of the attractions of a volume genuinely worthy of his achievement.